Have you ever wanted to play Deal Or No Deal, but with none of that pesky money cluttering up the place? 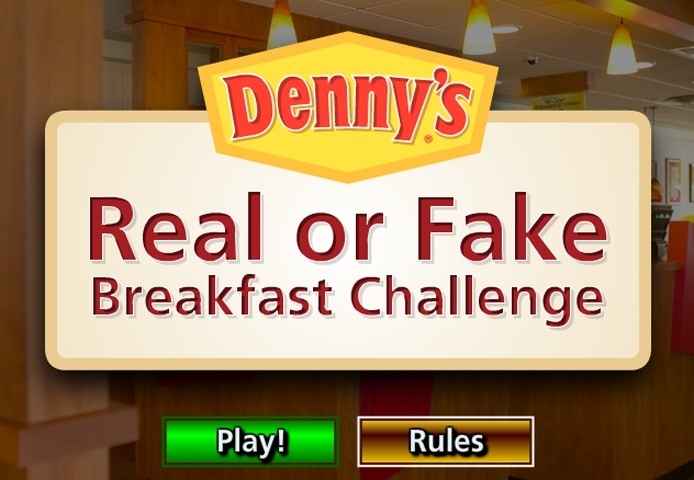 If so, Denny's Real Or Fake Breakfast Challenge is the game for you. Great Denny's Cooking game. remaining 25 platters to reveal one at a time. You will hear the Breakfast Authority Bell. • The B.A. will make you a special offer, based on the meals still in play. • If you accept the B.A. 's offer, you must select five of the remaining platters to eliminate from consideration. • The Chef will offer you another special meal, and play continues as before. If you want to play Denny's Real Or Fake Breakfast Challenge games online you have come to the right place! GamesLoon adds new Denny's Real Or Fake Breakfast Challenge games every week. This is your game portal where you can find the biggest collection of free Denny's Real Or Fake Breakfast Challenge games online. Do not forget to rate our Denny's Real Or Fake Breakfast Challenge free online games while playing!